The competitive intensity is evident on the faces of Sarnia’s Angela Sauve, right, and an unidentified Woodstock Thunder player as they battle for ball possession. 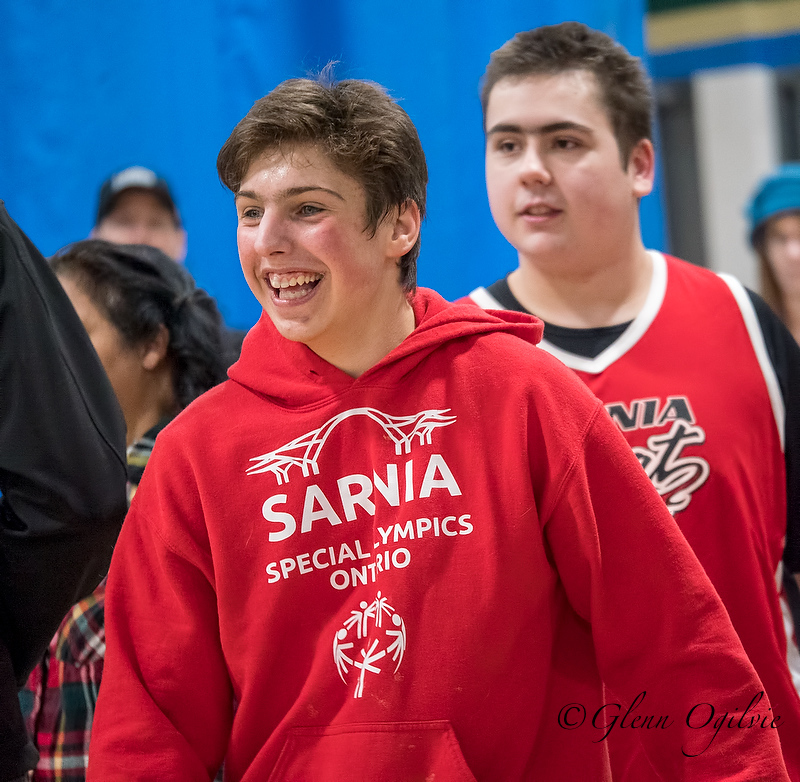 The competition was intense and the joy palpable when Special Olympics Sarnia hosted its inaugural basketball tournament at St. Patrick’s High School. 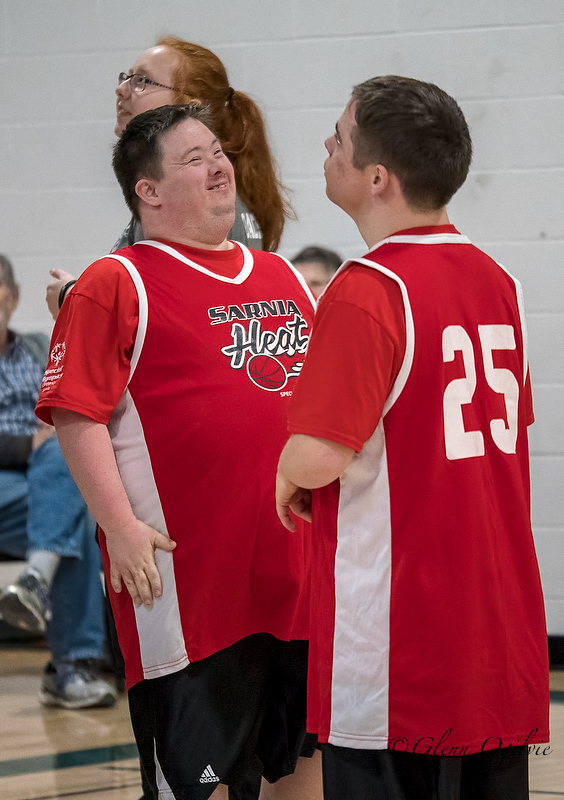 Two Sarnia Heat teams squared off against squads from London, Tillsonburg, Woodstock and LaSalle last month with more than 100 athletes in attendance. “Overall, it was just an absolutely amazing day,” said coordinator Tana Manchester. Some of the games drew crowds of up to 100 people including family, friends, teachers and assistants, cheering the athletes on from the stands. “Looking into the crowd and seeing someone they knew – their faces just lit up,” Manchester said. 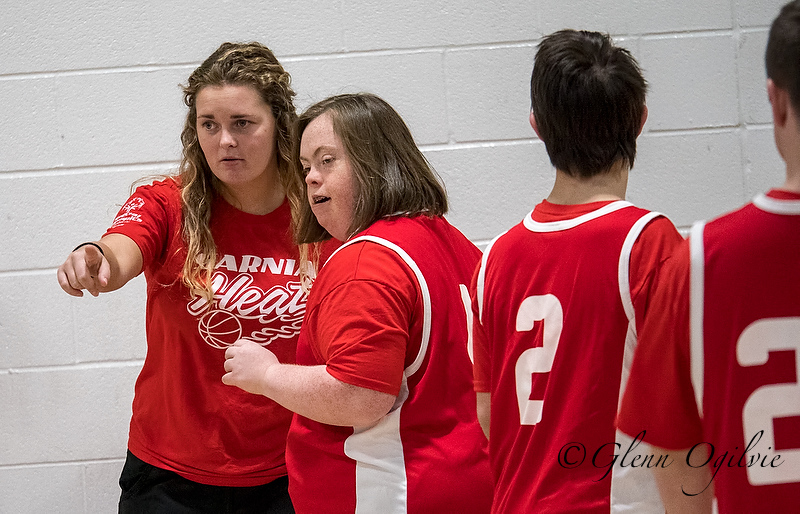 Athlete Marissa McDougall gets some direction from coach Paige Price during a game. 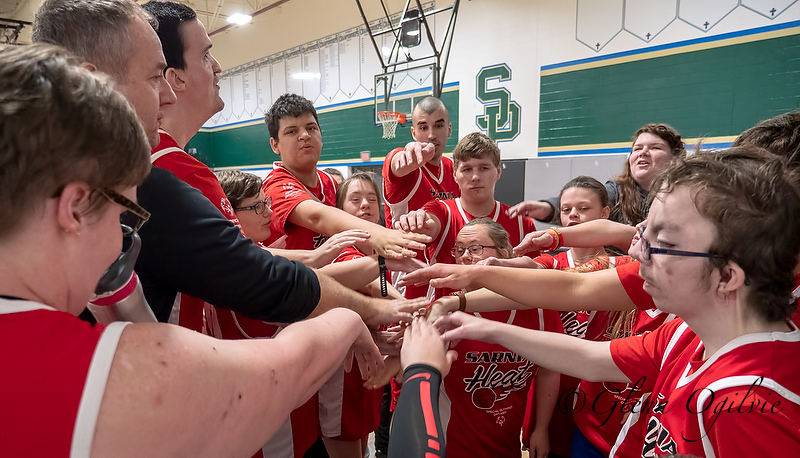 Many businesses helped out financially, supported by a large team of volunteers that included coaches, referees, Lambton College EMS students and scorekeeping high school students. 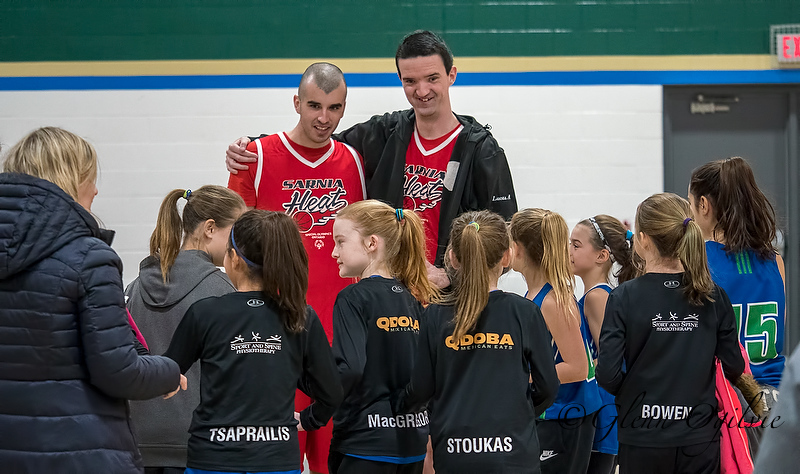 Lucas Canini and Lucas Adam pose with members of the Huron Lakers atom girls basketball team. The girls were playing in their own tournament and showed up between games to support the Special Olympians. 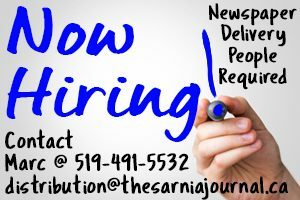 For more on Special Olympics Sarnia, including how to get involved, email sarnia.coordinator@specialolympicsontario.ca. William Laframboise, left, and Mitchell Clendenning are happy with the game results. 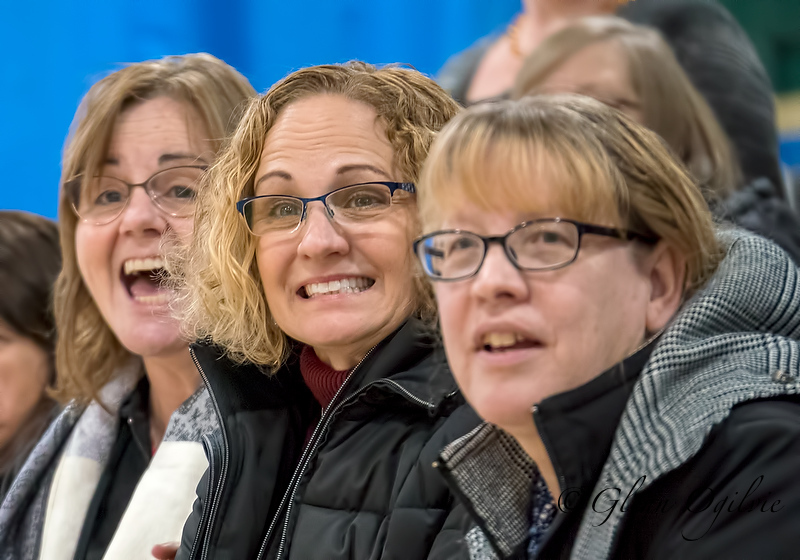 Cheering on the Sarnia Heat are, from left; educational assistant Beth Duchene, teacher Cindy Morrison, and educational assistant Barb McNair, all from St. Patrick’s High School. Andrew Galloway is all smiles after sinking a basket for two points. Looking on are David Redmond, right, and volunteer coach Madison Linker.